This topic contains 12 replies, has 8 voices, and was last updated by joss 4 months, 2 weeks ago. 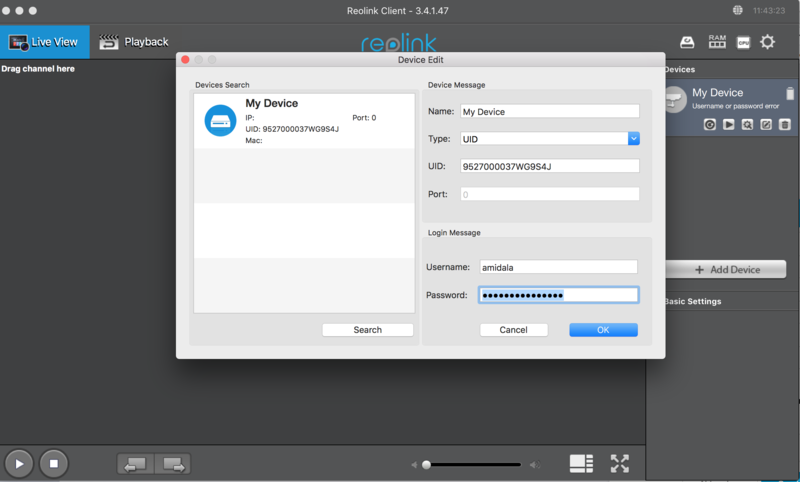 Reolink Client does not recognise my camera – I get a “Search device failed” message. The App on my phone works fine, and I can see the IP address of the camera. I input the Device name, IP address, port defaults to 9000 and with or without the Password I used to set up the camera, I get the same result – “Search device failed”. I can see the camera on my network by using arp -a in Terminal and my router also recognised the camera. However the client does not. Mac OS Reolink Client is not compatible with Reolink Argus for the time being. There is such a plan, though. You may subscribe our emails to get the news: https://reolink.us13.list-manage.com/subscribe/post?u=c0cb1c1b65426a6d9b3609705&id=a9bc53daec. Hi Bob – thanks for answering my question. I’m disappointed. I had plans to buy a whole set of (solar powered) Reolink Argus around my property. Now it seems I’ll need to look for another solution. Do you have any information on when the software update will be available. Are we talking months or years? I have exactly the same problem. The website should make this limitation more clear. Bob, do you have any alternatives for Mac OS X clients that do work with the Reolink Argus? I tried Sighthound Video, it is not recognized there either. 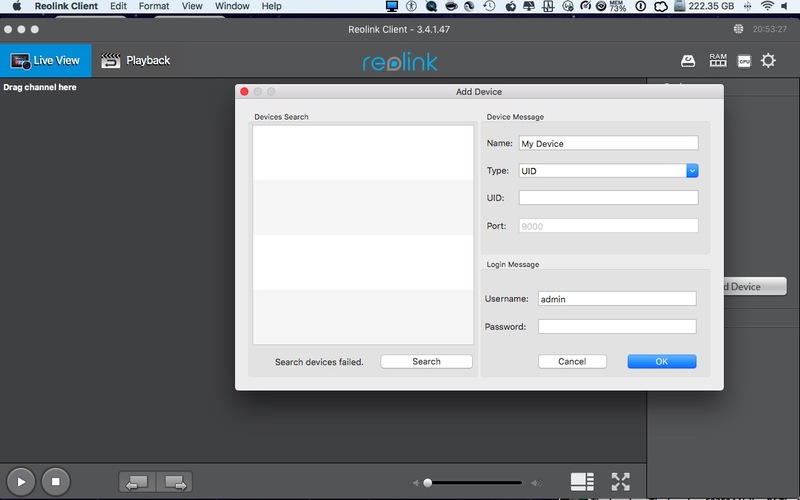 Which (if any) of the Reolink camera models *do* work with the Reolink Client software? Mac OS X clients will be available in months. @sophie D, Reolink Client software works with all Reolink products (Battery powered cameras to be supported soon). I also have trouble with the Mac Client. I have the latest version I think 3.4.0.46, does anyone know if will allow viewing the camera image on a Macbook Air running macOS High Sierra 10.13.4? Now please update your Mac OS X clients to V3.4.0.46 so that your Reolink Keen, Argus1, Argus2 cameras can be compatible. Is this the correct way of looking for the camera, if not please let me know how it should be done. I can see the camera in my router. i have the same issue. How can i connect to my reolink argus 2 cam. I find a device. It doesnt matter, if I fill out everything, with my password and so on. But it doesnt connect. There is a little bit problem for your operation. We can only find the camera when it’s in the same local network as your router. Or it couldn’t be searched. Please try to add it by entering the UID of it. Please refer to the link below to add it to the Mac client to see whether it works after that. We have done the test here and we were able to add a Argus camera to Mac client which means they are compatible now. When you try to add a camera to Client, Client will access server first to obtain some related information about the camera.It will show failed if camera can not obtain the information. Why it failed to obtain information? It might be the firewall settings on your router caused this. Please have a look. I have Reolink Client 3.4.2.49 installed, but it still does find the Argus 2 camera. Both computer and camera are on the same wireless router. Has anyone had success adding an Argus 2 battery operated camera to the mac client? 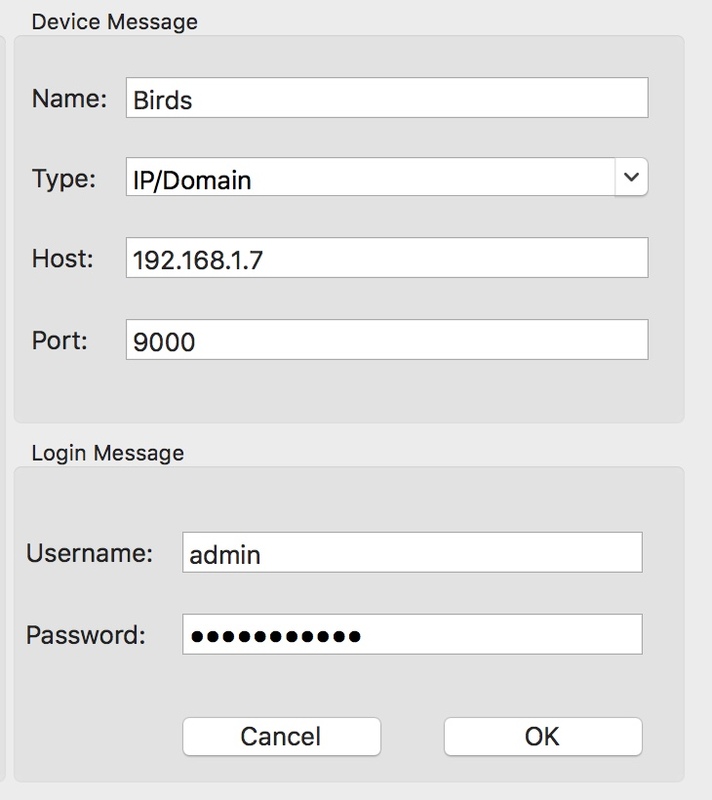 On the Mac client – what password do I use? Nothing works. Cameras are found okay.